For the full story, check out this VeloNews column about lifestyle instead of training. Neat attitude piece, but of course Crawford is weak on the math part of it all. I would think that our bodies just don’t use much energy that would produce significant gain for the power grid. If someone wants to do the math on a few of the ideas, please insert it as a comment. Cool video from the SF Bike Coalition and the SF Police Department. It is meant as a training video for SF Police, but has good lessons for motorists and cyclists as well. I saw this video on the East Bay Bicycle Coaltion web site. I think most of my experience cycling friends understand this. However, I know of at least one Berkeley Honda driver that doesn’t. Enjoy, and “take the lane” to be safe whenever necessary. Thanks to Centerlinesoccer.com for turning me on to this guy. If you know about the public loaner bikes in Paris, you can be really outraged! Take soccer to the streets! Turn up the volume, and enjoy more of Remi here! … as we turned right up Coleman Valley road. Immediately, one is on the climb up Irish Hill. 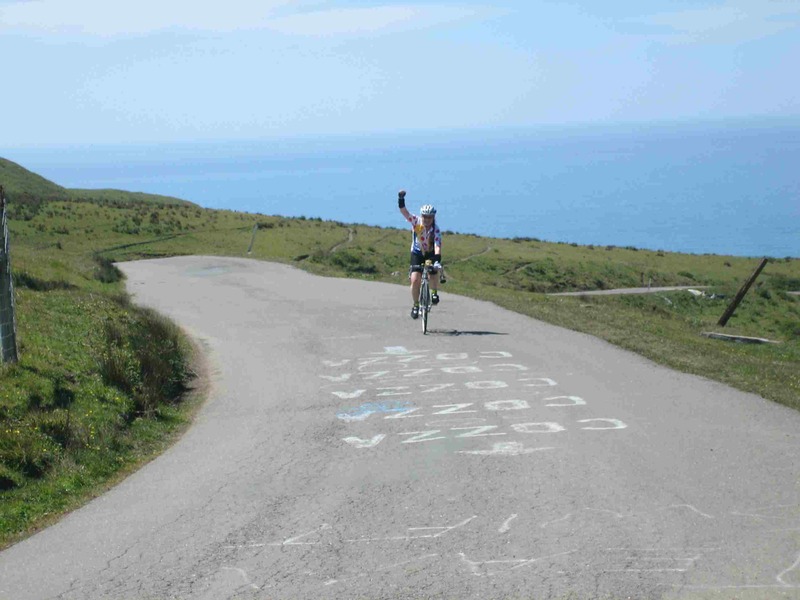 The Tour of CA went up this road; there is evidence of the tour with painted greetings on the road. Maybe a mile and a half, relentless climb, maybe 800 vert feet at 12 to 15%. Of course, today was the warmest day of the spring so far, so we were drenched when we paused in the cow pasture at the top to enjoy the views back down to the Pacific below. Now there were easy rollers up on this perfect bike road, very few cars, endless ridge views both north and south. 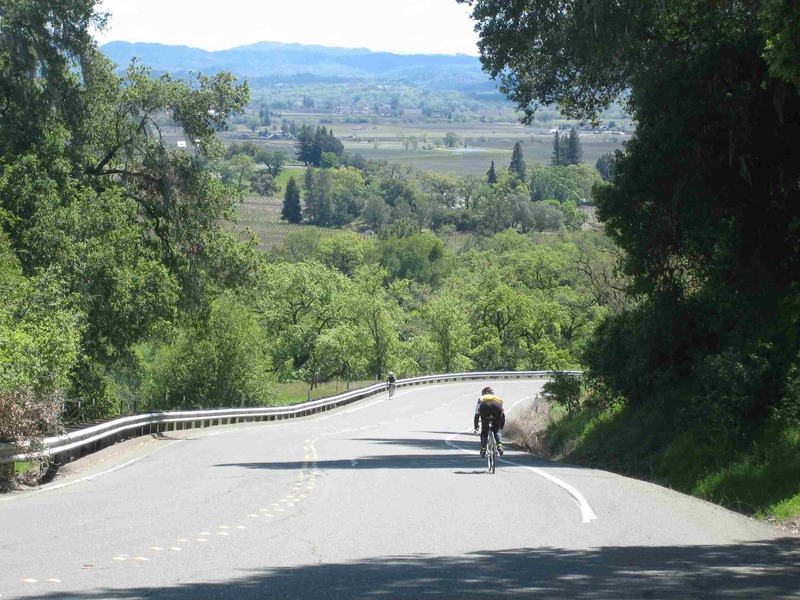 Then back down to Occidental, Graton road, and zig-zag back to Windsor. This was a great ending to our time away in the Sonoma wine country. This last ride was of course beautiful, with the bonus of the ocean. While we had talked about doing the King Ridge loop some ten miles up the coast, it was wise of us to save that for a later time when we are a bit more fit. Of course, so many potential places to ride, so little time. So make the best of the opportunities. Drove to Geyserville, then ride to Cloverdale, up Geysers Rd. Big headwind on first leg going into Cloverdale that slowed our pace. Once on Geysers Road, Sherie and I energized with the absolute beauty. From the north, this road has lots of one lane, some gravel sections in old washouts, but we saw less than ten cars on the road in the next 10 miles. The stream flowed at our side, we ascended nearly 2000 feet from the oaks and grassy hillsides, some chappall, then into the pines mixed with buckeye, bay etc. The hillsides still green with grass, lupine, poppy, and more abounded. On this leg, we saw turkey vultures eatiing a road kill rabbit, Ben saw a bobcat at about 50 feet until he hid in the rocks beside the road. A hawk circled at about 25 feet above us looking for a thermal. Eventually, about 12 miles up, we could see the pipes on the hillside leading to the power turbines. One set of cooling towers vented steam to the blue skies. Old mine buildings dotted the hillsides, and then the larger road connected on our right. Well, this grade is as tough as advertised. It does seem like a mile, although it may be a touch less. However, it is all 15% to 18% for this stretch, luckily with two full lanes plus decent shoulders. And almost no cars. Just your leaden legs trying to keep the crank turning, standing to slow the pace. Ben made some slow loops in the three turnouts to keep the heart rate only at maximum. Sherie paper-boyed much of it. But we both rode it to the top. After this, it levels out for a bit, then a down, then another uphill. After this, a short traverse leads to the highest vineyards above Alexander Valley, for Geyser Peak Winery. Anyway, when we got here, there was a poster warning of delays for a film company shooting a Gatorade commercial. Sure enough, around the next corner, there was a sheriff that stopped Ben. When Sherie caught up, he lead us down about a half mile through the “movie set” where there were road side camps, kilometer markers, French villages on the road side. There were bike barriers with posters, a French TV van, etc. to make this big climb above the valley look like the Tour de France Once to the bottom of the “set,” we saw the crew having lunch under tents. I would guess there were about 50 people hanging out. Kind of fun to see. Anyway, this downhill leg is shorter, with more sustained climbs, than the long climb up Big Sulpher Creek that we did early. A good direct climb, a great training climb ala Diablo. Many places at least 12%. After that, a short jaunt back to Geyserville and the car, and a stop at the country store for deli sandwiches and drinks. Again this morning we left straight from the condo, but headed east to the old Redwood Hwy to take us south toward Santa Rosa. We tried to skirt around the east side of the town, and discovered that a short leg east on Mark West Rd to Reidli Rd kept us out of town. While Reidli has a few steep steps, it led to a valley where Wallace Dr led us south. Going east on Badger, we found a beautatous city park for a potty break. Here “Charlie Brown” greeted us with crazy talk as we remounted for the short leg on the Calistoga Rd east. Now I knew that the Calistogo Rd would have too many fast cars. What I didn’t know was that it would start right in with about a half mile of ten to fifteen percent switchbacks and curves, with very short breaks! “Sorry Sherie!” We both soldiered through, glad it was still cool, me waiting at the pullout at the top of the ridge. Man, we both baked the legs on that one. After a quick down, we turned right onto the St Helena Rd (Spring Mtn on the Napa side) that would lead to that famous valley to our east. How pleased we were, as we saw the last of the wine grapes for a few hillsides for grazing, but then the forested hillsides rising from a flowing stream. We followed the stream for miles, steps up through oak forest to pine, with some redwood groves along the creek. This is a small country lane, barely two cars wide in most places, with some traffic for the homes along the road. It was bike heaven for the filtered sunlight through the trees, the scent of the forsts, the sound of the flowing water, the splash of the lupine and poppy. 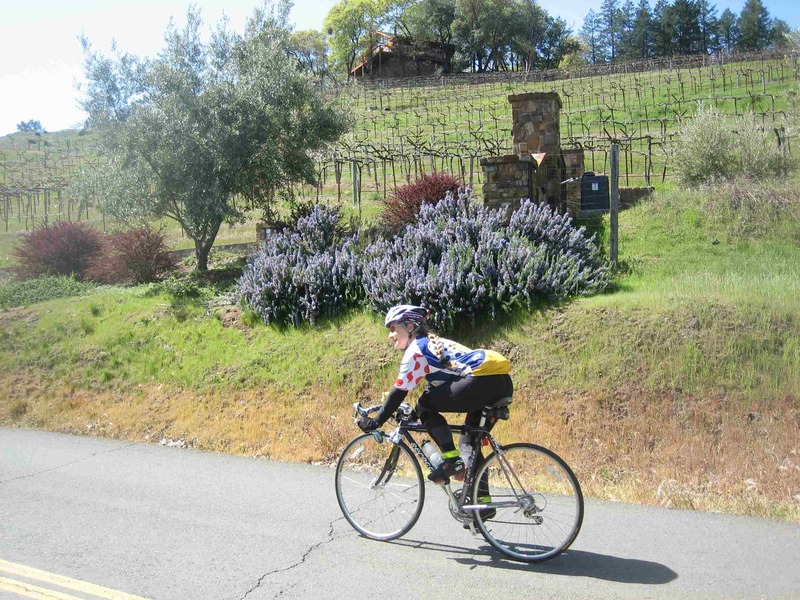 We eventually climbed out of the trees to a big vista near 2000 feet where the pavement improved to perfect at the Napa County line on the ridetop. After 40 minutes up Silverado to Calistoga, Sherie wanted lunch at the Wappo Bar and Bistro. Fancy lunch in a sunny garden in our sweaty bike clothes. Very relaxed, quite a good lunch, but we passed on the wine, although we lingered a bit in the sun to digest a bit before the climb back out of the valley toward the west. After a half mile on Petrified Forest Rd, Sherie yelled at me from behind to get out of the traffic and take the side road. Which we did, up Franz Valley School road, much quieter but requiring an additional climb and some extra miles. Boy it was worth it to be back on a lane with the spring greening the hillsides, and the sun warming us up the climb. I stripped out of my leg warmers and vest, rolled down my sleeves, and enjoyed some sun between the trees. This is a great bike road, the best of rural NorCal scenery with mostly older funky homesteads instead of all the new McMansions that have sprouted too widely. After the downhill, back to Mark West Rd to return to Santa Rosa. This is scary narrow with too many fast trucks and cars at times, but sometimes with a decent shoulder. Sherie and I both saw (me tucking ahead at speed down the hill) a lone bicyclist tight in the draft of a small motorcycle heading up at a good clip. He was in white and blue, but didn’t look at me when I waved, staring only ahead. We both swear it must be Levi Leiphimer drafting on his wife’s pull, although we couldn’t prove it. Soon back to the condo, a great and beautiful day.